Technological advancement has reduced aircraft fuel consumption and emissions significantly over the last 30 years and this is expected to continue in the future. The industry’s historical transition from piston engines to modern high-bypass turbofans resulted in major advancements in energy efficiency and environmental performance. During this same era, the industry developed and deployed new, lightweight, high-strength materials, automated navigational, operational, and engine control systems, and employed vast new computational capabilities to improve aerodynamic efficiency and integrate highly complex operational strategies. Changes to fleet average fuel economy progress slowly as commercial passenger service aircraft typically remain in the fleet for 35-40 years. 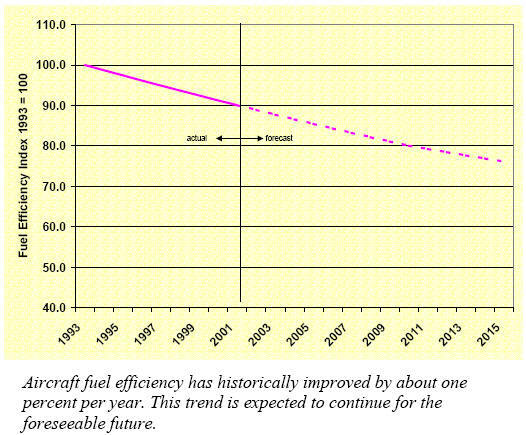 The next chart8 shows the trend and projections in aircraft fuel economy over time. As they age, existing aircraft are retired and replaced with new aircraft. New aircraft also are added to the fleet for new capacity. 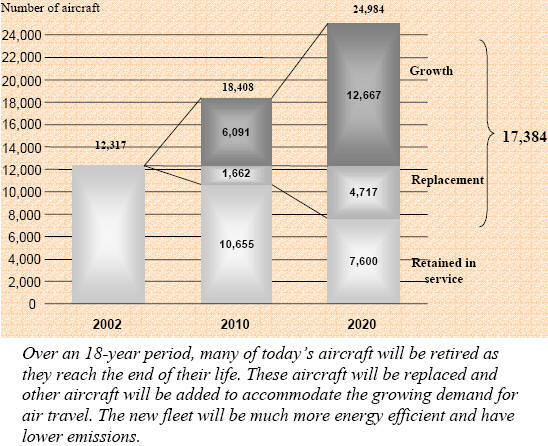 By 2020, 70% of the fleet will be aircraft added since 2002, which will have advanced technology and capabilities. The chart below, replicated from an International Civil Aviation Organization (ICAO) report 9, illustrates this transition of the international commercial aircraft fleet.